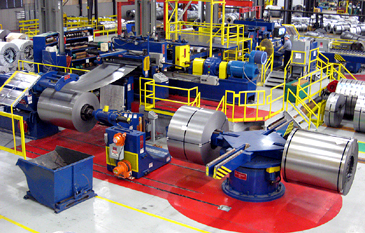 LaVergne, TN - SteelSummit, a subsidiary of Sumitomo Corporation of America, has installed a high-performance Braner/Loopco Double-Loop turret Head™ Slitting and Slit Coil Packaging Line, featuring a Shape-Correction Cluster Leveler™ in its LaVergne, TN coil processing facility near Nashville. 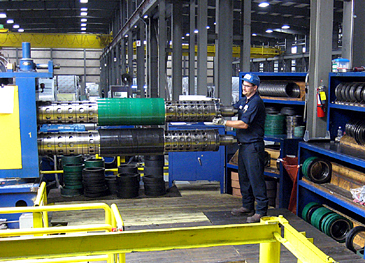 The Double-Loop Slitting Line joins three (3) other Braner/Loopco Single-Loop Turret Head™ Slitting Lines in SteelSummit's LaVergne, TN facility. 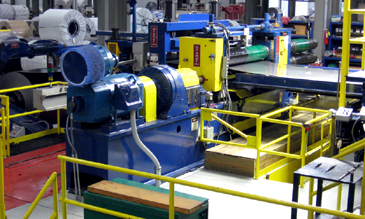 SteelSummit's latest high-performance slitting line employs 600 horsepower for processing surface-critical automotive coils weighing 70,000# in widths to 76" at slitting speeds to 1,000 FPM. Coil gauge capacity is from .012" minimum through .187". The DC motor driven loop-control Uncoiler fitted with an Outboard Support drives the coil into a free-loop ahead of the slitter in the Double-Loop tension-free slitting mode. Tension-free slitting eliminates tooling induced strip surface scuffing, and generates tighter tolerance slit widths. Single-Loop and two (2) Tight-Line operating modes are employed for slitting medium and heavier gauge coil. SteelSummit's Turret Head™ Slitter produces close-tolerance slit strips with minimum burr throughout the entire range of gauges and mechanical properties. The unique Turret Head™ Slitter design allows for quick re-tooling and a 2-minute head change cycle. Reliability is bullet-proof. The Turret Head™ Slitter is equipped with two (2) slitter heads supported in massive precision machined solid steel bearing housings. The rotatable Turret is supported on a precision anti-friction ring bearing, which assures precise arbor alignment and accomplishes effortless head changes in one-minute. The slitter heads at the "set-up" station are open and accessible with no housings, bases, or structures to obstruct tooling removal and installation. Free and clear access and quick-change ability gives Turret Head™ Slitter users the ability to make more set-ups and head changes per shift than with any other multi-head slitter or tooling transfer design. Turret Head™ Slitters are equipped with multiple "integral" slitter heads that do not detach and uncouple in order to change heads. The one-piece integral design makes Turret Head™ Slitters more rigid, more precise, and more reliable than any other slitter or tooling transfer design. 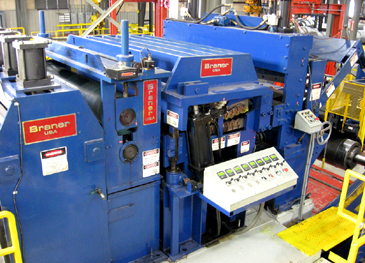 Strip tension required to produce tight straight-wall slit coils is generated by a Pad Tensioner and a Non-Marking Roll Tensioner. 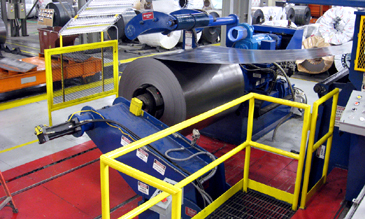 The Pad Tensioner is engaged when slitting non-critical coil, and the Roll Tensioner is employed for processing surface critical coil. The Pad and Roll Tensioners can be engaged independently or in tandem. A computer controlled Cluster Leveler™ corrects strip shape defects such as wavy-edge and center-buckle while rolling slit edge burr, allowing SteelSummit to produce a superb quality product for its customers. The Cluster Leveler™ has the capability of shape-correction throughout the entire .012"-.187" gauge range.